Total Deal Search is not a typical adware program. Once it is installed on the computer or enters the system together with other applications, it immediately sets a new page as a New Tab URL on browsers. For the time being, it is compatible with Google Chrome only, so users notice changes applied to this browser only. Of course, it does not mean that a version working on all web browsers cannot be released in the future. The page Total Deal Search sets contains coupons which supposedly should help users save some money. Users should also be informed about deals and sales at certain online shopping stores. On top of that, there is a search box in the middle of the page. Although it works well, i.e. returns search results for users when they enter a search query, it might be a really bad idea to use it as a default search tool, according to specialists working at pcthreat.com. It is because all web searches performed via this search box are redirected to http://api-client.mobitech-search.xyz/. This search engine is developed by Mobitech, and it definitely cannot be called trustworthy. As a consequence, users might mainly see sponsored search results. In most cases, they are shown to users to get the pay-per-click revenue for their every click, so it might be true that the main purpose of Total Deal Search is to generate money for its developer as well. Since it is not the most reliable application for online shoppers, its deletion is highly recommended. Once it is gone, you could install a reputable program with even more useful features in its place. An official website of Total Deal Search has been discovered, but users keep reporting that this program has entered their PCs illegally because they cannot explain when and how it has shown up on their computers. Researchers cannot confirm that this application sneaks illegally onto computers, but they are sure that the bundling method is used to spread it. Specifically speaking, it travels in bundles with third-party applications and users install the entire software bundle without even suspecting that an untrustworthy program is placed among these decent-looking free applications. Technically, users allow Total Deal Search to enter their PCs themselves, so specialists cannot say that it enters systems silently. 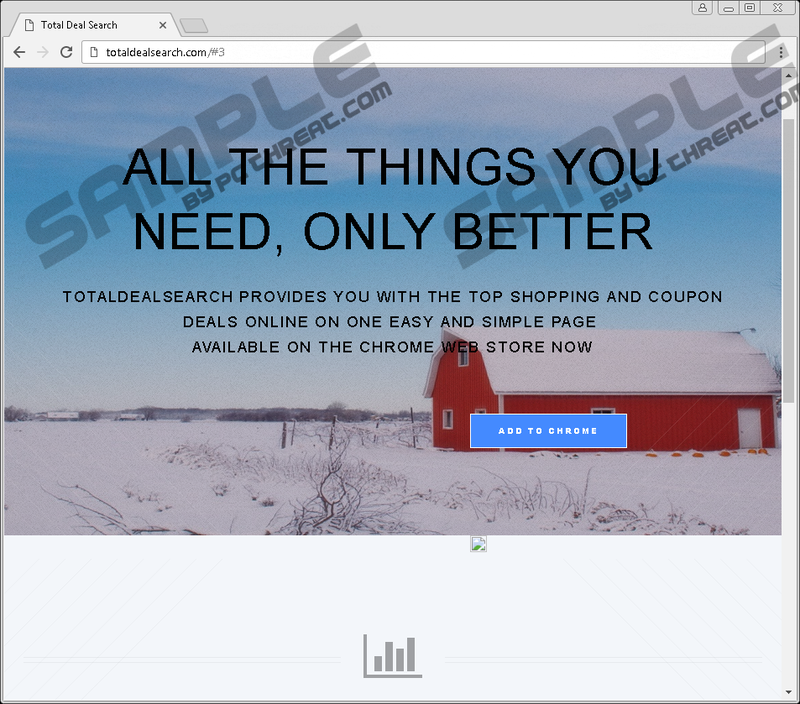 Total Deal Search is installed as a browser extension. You will find it in the list of add-ons on Google Chrome, but it is advisable to check other browsers installed on the system too. It should not be hard for you to delete the undesirable extension with the help of our manual removal guide. Do not skip a single removal step and go to perform the full system scan with SpyHunter after the deletion of this adware to make sure that ALL threats are gone. Launch the main menu by clicking on the top-right corner button. Select the undesirable extension and click on the Trash button next to it. Click Extensions on the left side of the page. Select the extension and click Remove. Quick & tested solution for Total Deal Search removal.